Free! is categorize as a sport anime, it is one of the few that can balance well the Slice of Life genre with the Sport genre. Free! is a slice of life with drama using sport as support, swimming races are often used as trigger to start or finalize a character development. It might be categorized as a sport anime, but drama is worthy of any Slice of Life and became a trademark of this series. Each season as its share of dramatic moments, angst, fight between childhood friend. Free! take the big piece of the cake when it come to lack of communication, miscommunication and misunderstanding. If there is none of that, it cannot be a Free! series. The lack of communication lead to a lot of misunderstandings which lead to those fight. Just take Makoto and Haru‘s fight from the second season as example. If both parties would have talk more, express their feeling, frustration and their insecurities, I don’t think this fight would have happened. More recently in the 3rd season of Free!, Free! Dive to the Future, and other big fight happened between longtime friends and once again it is due to the lack of communication and a lot of misunderstandings. For this year Megane Day, I decide to talk about a character from Free! who received a lot of hate in the beginning, but like all the “antagonistic” characters (see Sousuke in the second season or Aomine from Kuroko’s Basketball), he is/was just misunderstood, Hiyori Toono. When we first have a glimpse of Hiyori personality, it is during the newcomer competition, he is leaning on the guardrail watching the race and he state that all those swimmers are just a mere copy of Ikuya. 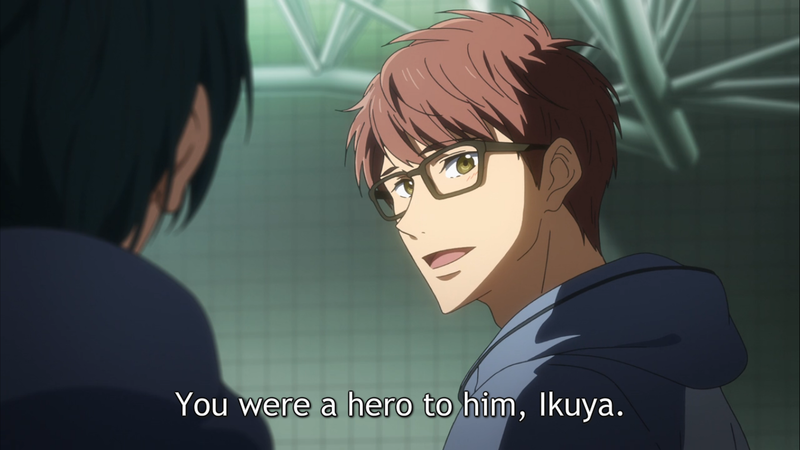 Then there is all the moments where he didn’t allow Haru and the others Iwatobi boys to meet Ikuya, he even go until saying that Haru have some kind of curse and everyone who swim with him end up getting hurt (must admit I wanted to punch him so bad when he said that) to make sure Haru stay away from Ikuya. If one of the reason why Hiyori block Haru, Makoto and Asahi from seeing Ikuya was partially caused of Ikuya himself, the later didn’t want to see them, but also cause Hiyori feared Haru have a negative impact on Ikuya. Hiyori was afraid that his friend push himself too much during the practice to the point where he forgot everything. 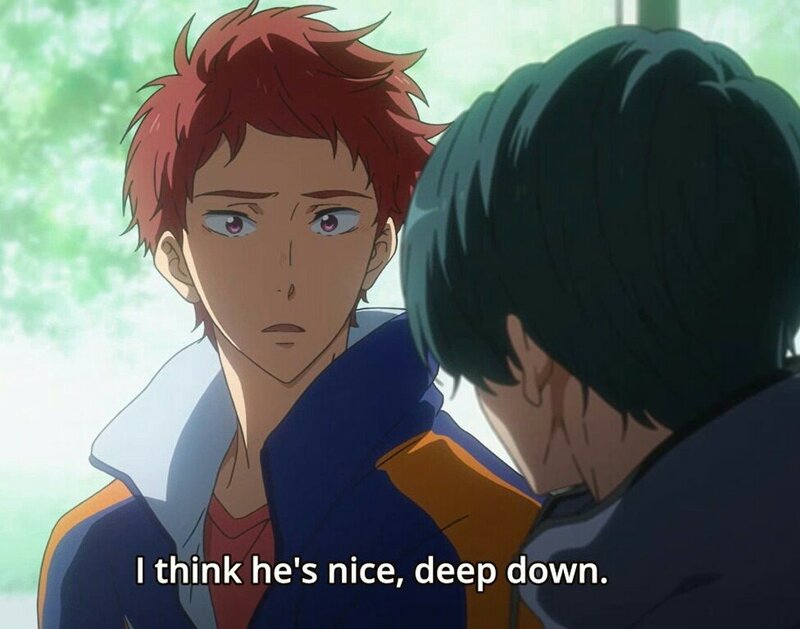 It happen at least twice in the past, Ikuya almost drown during practice because he had push himself too much, Hiyori doesn’t want to see this happen again, therefore he do everything he can to keep Haru away from Ikuya. Hiyori doesn’t want his friend performance suffer because of ghost from the past. Ikuya time and swimming performance are important, he worked hard to get where he is and aim for the global stage. Hiyori is not the only one to worried about Ikuya’s time, the later big brother, Natsuya, also worried about it and ask to Hiyori to keep an eyes on his younger brother, knowing that if his performance start lacking, Ikuya might start to push himself too much, Natsuya request might have put an additional pressure on Hiyori shoulders. Ikuya is Hiyori’s friend, but he also can be seen as his hero. When he was younger, Hiyori always been alone, his parent were always working, leaving him by himself at home or at the park (talk about responsible parents). while he was used to be alone, Hiyori still felt lonely, putting up a fake smile to not worry anyone. One day he met someone who will have a huge impact on his life, this person asked him to swim with him with a big smile and for the first time, Hiyori was able to make a genuine smile. 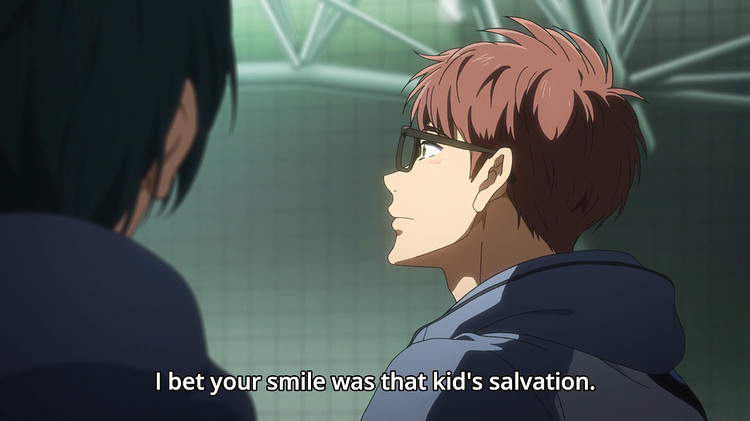 This person was Ikuya and without knowing it, his smile was Hiyori salvation. He gave him a reason to look forward the next time he would go to the pool. Then they lost sight of each other after they move in the US, to meet again there, however Ikuya didn’t recognize Hiyori, but the latter did and they eventually became friend. When Ikuya moved back in Japan, Hiyori followed him to keep and on him, to make sure Ikuya don’t push himself too much. Ikuya became really important for Hiyori, he was his first real friend, a friend who helped him to get out of his loneliness. The Little Mermaid was Ikuya and Hiyori favorite book, but not the Disney sweet happy ending story, no the original one where the little mermaid have to kill the prince in order to get back her tail, however her love for the prince, blinded her and instead she jump in the ocean and become foam. Hiyori and Ikuya friendship have some parallel with The Little Mermaid story, Ikuya being the Prince and Hiyori being the Mermaid who saved the Prince. However, like in the story, Ikuya focused on someone else which is Haru and Hiyori is not only afraid that Haru hurt Ikuya again, but also to lose him as a friend. What if Ikuya start to hang with Haru and the other and forget Hiyori like the Prince focused on the young lady you found him on the beach and forget about the mermaid who saved him. There was a lot of reason why Hiyori didn’t wanted to see Haru around and one of them was because he was afraid to be alone once again. Ikuya and Haru are on part when it come to freestyle and Hiyori was probably scared to get left behind while the two old friend drive themself to the top. Hiyori insecurities in front of Haru’s talent appear and the only way for him to avoid that was to make sure Ikuya and Haru don’t meet. Yes Hiyori didn’t wanted to see Ikuya to suffer again and to push himself to exhaustion until he drown in the pool, but he didn’t wanted to be left behind either, he wanted to be the one who keep pushing Ikuya by supporting him, with Haru around thing would be different, he wouldn’t be the one Ikuya talk to when he have his concern about swimming, Haru would be. I said in the intro, Free! Is known for is lack of communication between the characters, if Hiyori would have opened up just a little bit more, thing wouldn’t have turn the way it turned, his biggest fear wouldn’t have almost come a reality. For a solid relationship between friend, a good communication between the two parties, it’s a must, therefore not voicing our concern can lead to a lot of misunderstanding. It’s not something easy to do, but being able to be truth without assuming how the other would react is a sign that you trust your friend. Hiyori always voice his opinion about Ikuya’s time and well-being, however he never said once how he was feeling deep inside. If we would have said the truth since the beginning, since the moment he spoke to Ikuya when they met again in the U.S thing would have been different and Ikuya seems to be the understanding kind, but for that you need to tell him the truth without hiding anything. Deep inside, Hiyori is not a bad guy, he is just insecure about himself and didn’t took the best way to protect what is dear to him, his friendship with Ikuya. Of course there is more than that, Free! Is more than a sport drame anime series with half-naked boy walking around. Each character is complex and have is own demons they need to fight in order to get better. 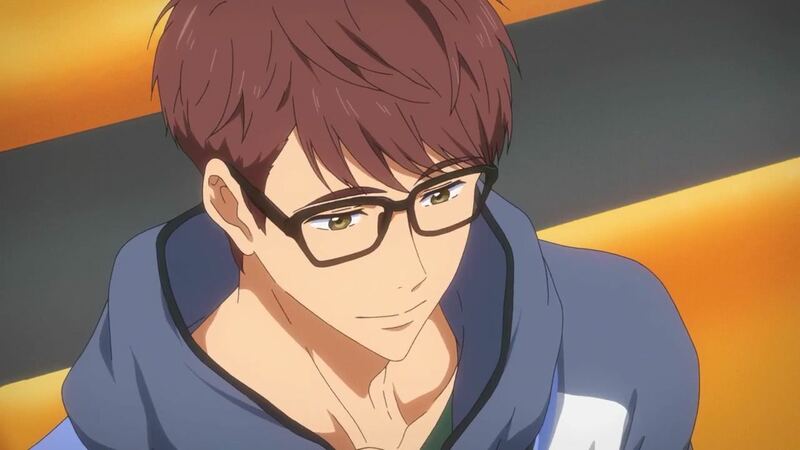 This post was written for two reasons, one is because of the Megane Day and Hiyori is a megane character, a very handsome one, I knew I would like him soon as we saw him for the first time, plus he is a mix of Sousuke and Tsukki, he want to protect his best friend future as a swimmer on the global stage but with a lot of salt in his word. This lead to the second reason why I wanted to write a post on him, he received a lot of hate for what he said, he rub a lot of people the wrong way, however as I said in the intro, he is like Aomine and Sousuke, he have an antagonistic side, but deeply he is not really a bad guy when you take the time to dig under his jerk like personality. So this was my post for the Megane Day 2018, hope you enjoy reading it, cause I enjoy writing it, that poor by needed so love. There is other blogger who made a special post for today, if you haven’t check them out, don’t worry I will make a round-up post will all the link! Wonderful post. I think in general one of the hardest things to do is open up to someone, especially a friend (because what if he/she might leave because of what I might say). But if you are able to put that much trust in someone that you are able to share a part of your life whatever that might be, it definitely strengthens any relationship. I have never watched Free! but I might do so just because of this post. Hiyori’s feelings of potentially being left behind when Haru returned to Ikuya’s life rang up as very real, very poignant to me. After all, it is as you say: Hiyori has to compete with Haru’s skill, to which we all know only Haru offers the challenge that Ikuya needs. It wasn’t until this point that I realized Hiyori’s weakness wasn’t so much with others, but a lack of undertstanding and, yes, communicating his own feelings. I’m really glad you picked Hiyori for this special day—he is VERY much like Sousuke in the way that I didn’t care for him much up front, but grew to love his presence after all the “fighting”. Characters that are able to change our perceptions of them as they grow are the ones we should be talking about most of all! Loved this post! Oh, and Happy Glasses-kun Day!